“The structural design of shared information environments. The combination of organization, labeling, search, and navigation systems within websites and intranets. An emerging discipline and community of practice focused on bringing principles of design and architecture to the digital landscape.” (Morville and Rosenfeld, 2006, p. 4). The key concepts in information architecture include: organization, structure, labels, findability, and management. By combining and understanding the user needs and the information organization methods and structures, information professionals can support audience-related queries. 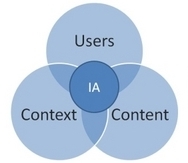 Information architecture incorporates practices from these fields and is developed from information science and human-computer interaction. Information architecture is a relatively new discipline and comes from a variety of different disciplinary backgrounds. Common disciplinary backgrounds that contribute to information architecture are information science, information/graphic design, journalism, usability engineering, marketing, computer science, technical writing, architecture, and product management. Information architecture is the foundation for a great web design. It is the blueprint of the site upon which all other features are built. 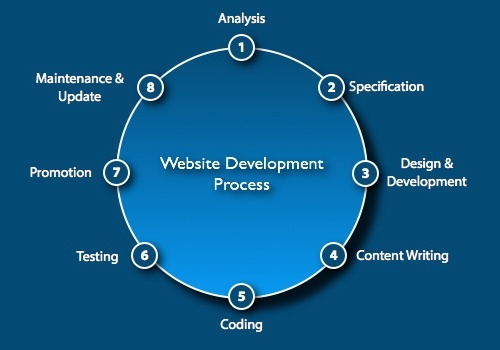 The web development life cycle consists of eight stages, listed in this diagram. There is also a six stage process that helps information architects ensure they have captured all of the relevant information required for the successful creation of a website. It is important that the architects consider all of these stages in order to effectively design a user-friendly and relevant site. Information architecture is a specialized skill set that interprets information and conveys distinctions between signs and systems of signs. It includes the categorization of information into a logical structure, preferably one that the intended user can understand intended audience can understand immediately, allowing them to simply retrieve the information they are searching for. The basic skill set required in information architecture directly relates to the concepts taught in information science: organization, content management, user interactions, database development, system design, and networking applications. The goal of information architecture is to improve information access, relevancy and usefulness to the intended audience. This core concept of IA is also presented in Ranganathan’s Five Laws of Library Science, more specifically in Ranganathan’s fourth law, “save the time of the reader.” This law can still be applied today in a more general sense, including the Web as a form of information (book). Ranganathan’s five laws were the building blocks for library science and are still applied in today’s digital age. Information professionals are experts in the field of research and can contribute significantly to information architecture with their knowledge of the tools, processes, indexing, and structure of organizing and managing metadata. With extensive knowledge of user-based research methods, librarians are helpful in making distinctions between exhaustive research, exploratory research, known-item research, and re-finding information. By discerning between these various research types, information architects are able to design a functional and user-friendly website that caters to the intended user/audience. Information architecture is an emerging discipline that is focused on bringing the standards of architecture, design, and information organization into the digital environment. WIth the rapid growth of web technologies, information professionals will play a vital role in future of information architecture and web design. Conradi, E. (2011). to_be_classified. Journal of Information Architecture, 2(2), 5-23. Morville, P., & Rosenfeld, L. (2006). Information architecture for the World Wide Web. Sebastopol, CA: O’Reilly Media, Inc.
Sen, B.K. (June 2008). Ranganathan’s five laws. Annals of Library and Information Studies, 55, 87-90.